The Telegraph, Daily Express and The Sun all note the start of a new trial by Veterans' Gateway, a service funded by the Ministry of Defence, to help vulnerable ex-servicemen and women. Veterans' Gateway is trialling an outreach service to phone ex-service personnel who have previously contacted its helpline. The scheme, paid for with £108,000 funding from the MOD, is based on the US Marine Corps veterans service, which makes six proactive calls for everyone it receives. The Telegraph article carries a comment from Mark Collins, assistant director of Veterans' Gateway, who said: "We will be monitoring the outcome to see how this trial impacts our users but hopefully it'll mean those most vulnerable will be able to access help from Veterans' Gateway supporting organisations, on their journey to getting the right help." The Sun reports on the RBL’s plans to mark 50 years since operations in Northern Ireland began. We do not traditionally commemorate the beginning of an operation, rather its conclusion or a significant turning point in a conflict, as with D-Day. However, we do grant funding to the Royal British Legion to deliver National Commemoration Events, including the anniversary of Op Banner, and we are currently considering what further support could be provided. BBC News Online and BBC Today Programme report that a former soldier is suing the MOD after contracting Q fever in Afghanistan. As legal proceedings are ongoing it would be inappropriate to comment. 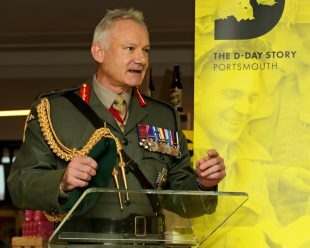 Image of the Vice Chief of the Defence Staff, General Sir Gordon Messenger, seen here at the D-Day Story Museum in Portsmouth on Wednesday last week.